Earlier this month I was asked to speak at the Foundation Board Meeting at the hospital. Here’s the speech I gave. Enjoy! Hi, my name is Rachael Benson. I have cerebral palsy and I’m 34 years old. I’ve been volunteering at Henry Mayo 10 years in July of this year. I’m known as the patient visitations volunteer. 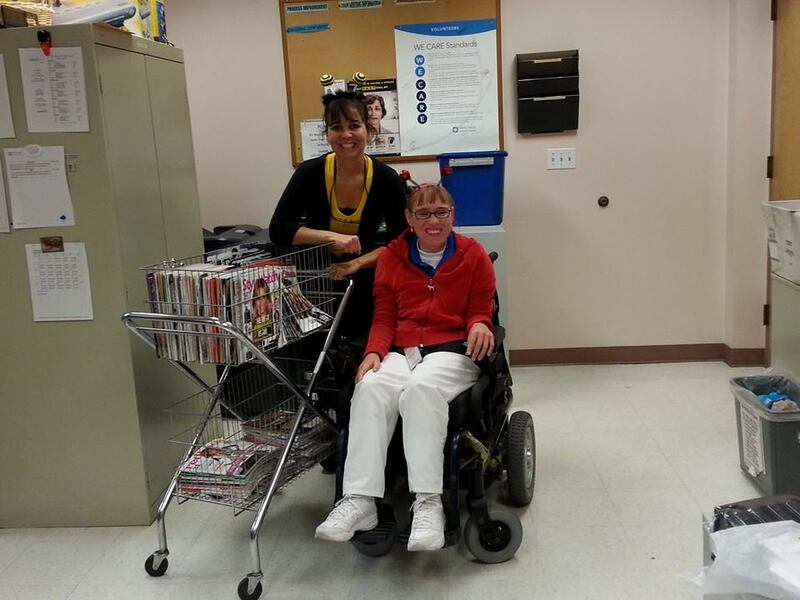 I go into the patients’ rooms and spend time talking and visiting with our patients while offering them a magazine. Traci and I are a team. I call Traci my cart pusher. She only goes in if it looks like there’s too much equipment and It’s going to be a tight squeeze. She also lets me know if it looks like a patient is asleep. If a patient offers me a tip, I explain that I can’t accept cash. The service is free but if you want to donate to the hospital in honor of someone this pamphlet is how you do it. Since we started giving out the pamphlet I’ve been nominated Healthcare Hero six times. Even if people don’t take a magazine they often say, “Thanks for coming by.” The fact that I’m in a wheelchair starts many conversations. People want to know what it’s like to be in a wheelchair because now they have to adjust to a new lifestyle and they just need someone to listen and relate to them. Sometimes I’ve inspired people to become volunteers at the hospital. I tell people, I love being here because I have cerebral palsy and people are often looking for a way to help the person with the disability. That’s fine but I like showing them that I can give back too. It gives me a sense of fulfillment. Coming here is a highlight of my week. People are impressed and often say, “Thank for what you do.” I reply My pleasure.” It’s not uncommon for me to hang out in a room and talk to a patient for a while. One time I talked to a patient who was new to being paralyzed in rehab and now he was going to be in a wheelchair the rest of his life. We talked for two hours. Outside of the hospital, I also volunteer at my church at my church at Grace Baptist Church on Wednesday nights in a program at my church called Awana. It’s a bible program for kids. It’s like boy and girl scouts but it’s Christian organized. I’ve been helping in it for 17 years. I teach the 5th and 6th-grade girls. The 5th and 6th girls are called the T & T club. That stands for Truth & Training. In October I did a lesson. How Becoming A Christian Is Like Becoming A Vase. It’s also on Youtube. If you want to check it out type in the title and then by Rachael Benson. Don’t forget the extra a or it won’t come up correctly. Remember the famous cook Rachael Ray? She spells her name the same way. I also have a blog. http://rachaelbenson.com/ I write a lot about my life experiences. I like to tie in a Biblical lesson. 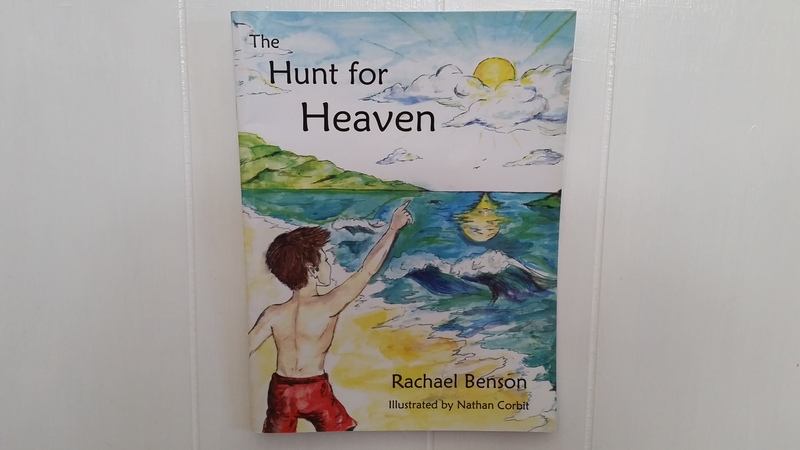 I wrote a book for kids called The Hunt For Heaven. It’s a picture book for kids ages 4-8. There’s a link to it on my blog. I’m trying to get more of my writing out there. I would love to have a full-time writing job where I write bible lessons for kids. I’m also a member of the Henry Mayo Fitness Center. I love it. I love the atmosphere and the people. They’re very knowledgeable and very caring. I work with a personal trainer on Tuesdays. My mom is also an associate member under my membership. Since I volunteer at Henry Mayo we get a discount. My mom often says, “Don’t quit your job.” I love being here at Henry Mayo and volunteering in the community. I look forward to many more years to come. Thank You. 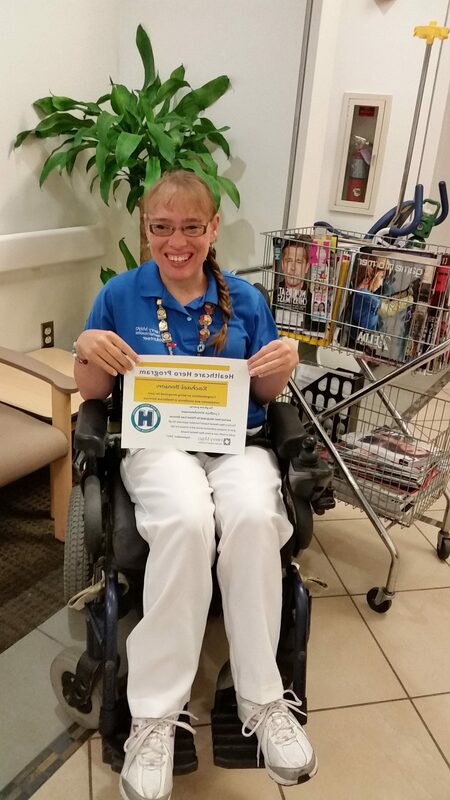 My most recent picture after being nominated Healthcare Hero. September 2017. Halloween 2014. Traci and I are getting ready to go work and “bug” the patients. It was great to see you the other day. Thanks for lunch. I loved reading the speech you gave and seeing the pictures. You look gorgeous 🙂 so clean cut.